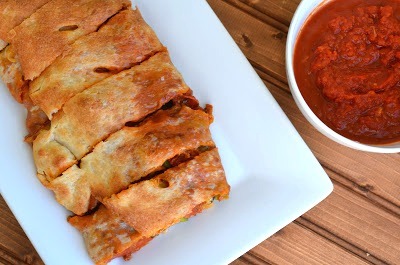 Stromboli is basically a pizza wrap. 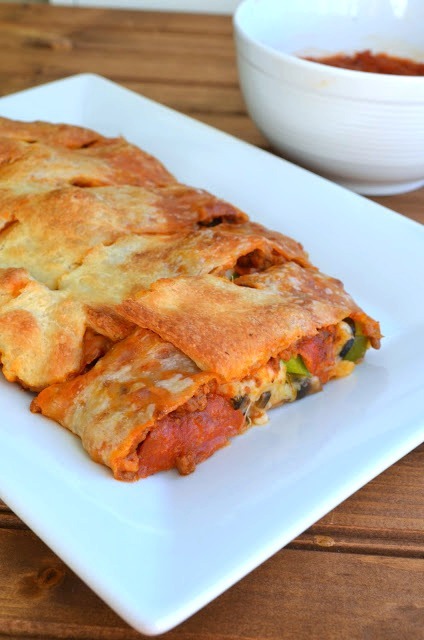 All the gooey deliciousness of a pizza is wrapped in crust for a portable snack. It's perfect for a game-time treat or to incorporate pizza into something classier for a get-together. This particular one is jam-packed with flavor. I added some chopped meat to the pizza sauce, then topped that with pepperoni, mushrooms, green peppers and olives. Oh, and cheese. Lots and lots of ooey gooey cheese. Enjoy! Heat oven to 400 degrees F. Spray a baking sheet with cooking spray and set aside. Brown beef in skillet. Once done, drain and return back to skillet. Add pizza sauce to the pan. Cook until heated through. Unroll dough on baking sheet. 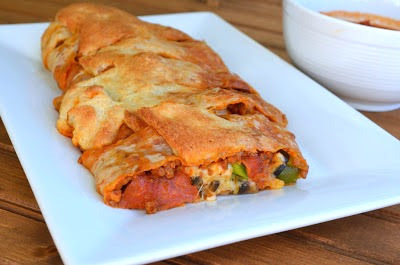 Spread meat mixture on dough, leaving a 1-inch border around the sides. Top the meat mixture with pepperoni, bell pepper, mushrooms, olives, cheeses and Italian seasoning. Roll up dough lengthwise and seal around edges. Cut slits across top to allow steam to escape.